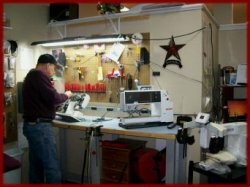 Our certified technician, Bob Smith, worked for Bernina of America as a factory trained technician/service trainer for over 23 years, traveling extensively to train other technicians how to repair sewing machines. All services are performed in-house. We service all brands of household sewing/embroidery machines and sergers. All factory warranties apply to the original owner. Damaged parts are subject to factory approval for warranty.